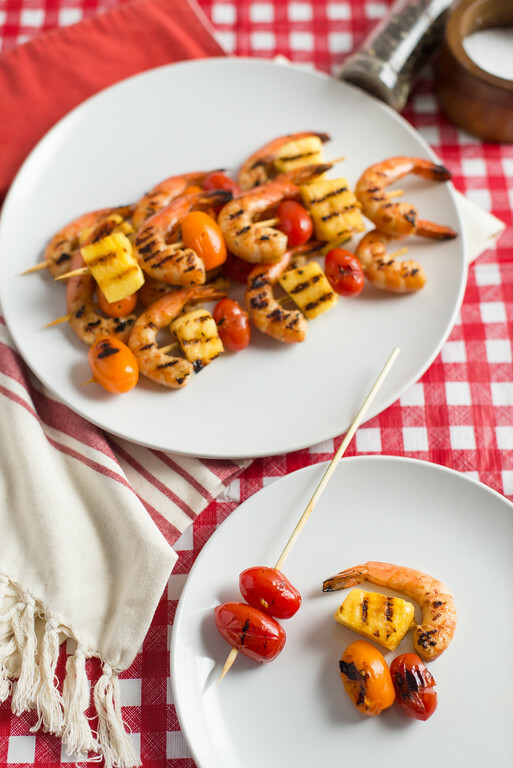 This is a VERY easy marinade that goes well with shrimp. Feel free to use other veggies and fruit on your kabobs. Nectarines or peaches would work very well. Be careful not to marinate the shrimp too long, as it will get mushy. Place soy sauce, rice wine vinegar, honey and sesame oil in a medium bowl and whisk until combined. Add shrimp, tomatoes and pineapple and marinate for 10-15 minutes. Heat grill to medium heat. Thread shrimp, tomatoes and pineapple on skewers. Double skewers work nicely (see picture above). Cook on grill about 4 minutes each side until shrimp is pink and cooked through.